Under a continuing grant from the “RPI Foundation for the Enhancement of Husbands” I have now taken TWO Egyptian cooking classes. The first one was “Egyptian Desserts,” which is what initiated the formation of the afore-mentioned foundation. There were a few days of concern as to whether they’d be holding the class as I was the sole signee a week prior. Ron had me asking anyone and everyone we knew if they’d be interested in receiving a grant from the RPI Foundation so the class could commence. Unfortunately I couldn’t find any takers, but luckily three other women were able to find their own financing for the $17 entrance fee so we were a go! 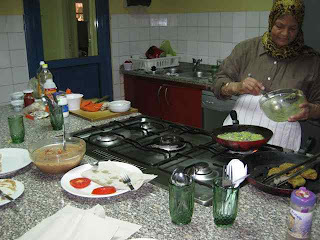 Raja is the instructor for all the cooking classes, and they’re held in a small, but highly functional, kitchen at CSA. She announced that we were going to learn how to make om ali, ba’lawa, and basbusa. Initially none of the names rang any bells for me, but as we progressed through I realized that I’d had basbusa before (it was okay, a little too heavy and sweet) and that ba’lawa was essentially baklava. Om ali and ba’lawa are made with fillo dough, which is readily available here in Egyptian supermarkets in the freezer section. Om ali is basically a milk pudding. You cut up the fillo and baked it until light brown and crispy, add it to coconut, chopped nuts, and raisins in a glass bowl, stir it all together and cover it with a boiled milk and sugar mixture. Sounds a bit strange (and sorry, I forgot to take my camera that day, so no pictures), but it’s apparently a common dish for Egyptian breakfasts (served cold) or as dessert (served hot/warm). I tried it and it was really quite good. The fillo soaks up the liquid so it has a bread-pudding-like texture. I’m going to try making it with soy milk and see how it turns out. Ba’lawa was amazingly simple! Now, one thing she kept pointing out was that Egyptians like heavy, sweet, syrupy desserts (I thought it was honey on everything, but I learned it was a sugar/lemon/water mixture). She knows that most westerners find them too heavy, so she cooked specifically for us and cut down on the sugar. For the ba’lawa she also cut back on the butter/margarine, so it wasn’t so rich. I have since gone out and purchased all the ingredients, including the glass side-fluted pan for baking it in. I will attempt it this week. Who knows, this could be career-path #87 for me?! Finally, the basbusa she actually made from a box. The basis is semolina, with some spices. She adds her own things to it, including coconut and chopped nuts, makes it into a cookie-dough-like substance and then presses it into the glass pan. It ends up looking like a dense cake, about 1cm deep. Sliced almonds are often used to decorate the top. After it’s baked, you pour the boiled sugar/lemon/water mixture over it, let it soak in, and serve. Her basbusa was really good and far better than others I’d had – less syrupy and sweet with a semolina texture (kind of like non-soupy grits). Ron was equally delighted with my initial excitement and extremely encouraging with my continuing culinary educational pursuits. I have to say that since getting married I have actually enjoyed doing the cooking. This was no bigger shock to me than anyone who knew me. Before marriage, if a meal required more than one pot I wasn’t too interested. And if I could eat it out of the same pot, ideally while standing the kitchen, all the better. After marriage, since I’m the one with the dietary demands (no animals), I willingly opted to do the cooking, which also meant I suddenly had to pay more attention to presentation and taste. Ron is good about eating vegetarian when I cook, and I know when something’s a hit if seconds are requested. Throughout both classes I watched in amazement (and sometimes horror) as Raja skittered about the kitchen with burners on, flames flickering and her beautiful head scarves flapping in the breeze, just barely touching the flames. She was completely nonplussed, but I kept pointing out the exposed flame when she’d remove a pot or pan. My fire issues were showing. She’d also constantly say, “You look a like this,” as she cooked, stirred, chopped, or fried. Or “See please, see please,” if someone wasn’t paying attention. During the desserts class, Raja was asking us what we liked to eat here. I explained that I was vegetarian so I was enjoying the ta’amia (falafel), hummus, koushari, etc. She got all excited and said she could teach us how to make koushari during her next class. It was the second in a series of Egyptian Cooking, but she said it was fine for me to come for just the one class and she’d make it all vegetarian. How could I resist? Luckily the board members of the Foundation were equally excited about having home-made koushari, so another $17 was willingly coughed up. For the vegetarian class she made us fuul, the broad beans, or fava beans, are cooked with oil, cumin, salt, lemon and garlic, and she added tahina, chopped tomato and a little chili powder. Stir it all together and Raja served it to us on her homemade Egyptian flatbread. It was wonderful! (Note: These cooking classes are really a watch-n-eat class. Not knowing this, I didn’t take any writing implements the first time so had to race home and write everything from memory for the desserts. But for the vegetarian class, I came fully prepared with paper, pen and water.) Raja’s bread is definitely the best I’ve tasted anywhere so far. She said she has a special oven that cooks it on all sides. The few times we’ve seen it being made, it’s been in an igloo-like oven, like those used for brick-oven pizzas. Whatever it is, is works well. I don’t think my culinary aspirations will evolve to requiring my own flatbread oven, but never say never. Next she made ta’amia (falafel). She makes it from scratch (she makes everything from scratch and tells us repeatedly to never buy food from the street vendors, regaling us with horror stories of oil never EVER being changed, just topped off, and other such stomach-churning tales), again she uses broad beans that she chops up into a mash with a food processor, along with fresh parsley, dill, and other spices. 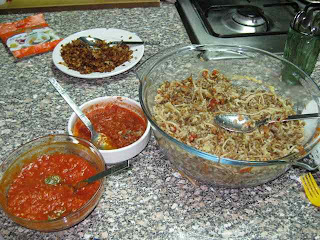 She brought this mixture from home, pre-made, but then showed us how to make it into little patties, sprinkle with sesame seeds and dried coriander, fry up lightly and serve with fresh sliced tomato on her amazing bread. (I took my camera for this class.) Definitely the best falafel I’ve ever had. She said she takes orders for the falafel mixture as well as her bread, so at the end of class I placed an order for two packs of falafel (at least four meals’ worth) and 10 pieces of bread (all of which can be frozen and kept). The cost for all of this? Four U.S. dollars. She’s also firmly saved in my phone now, for future ordering needs (it’ll be worth the drive to Maadi). Finally, she made the koushari. This is the dish I first tried at the Marriott on Zamalek. It’s a conglomerate of rice, macaroni, spaghetti, chickpeas or lentils, spices, covered in a tomato sauce with a red hot sauce on the side, sprinkled with fried onions. Not a dish for those who fear carbs (and happiness). It was quite a production, but nothing too difficult, and it made an enormous mound of happy koushari (again, definitely the best I’ve had in Egypt). At one point, when she was frying up the onions we were all getting hit with the onion effects, stinging eyes, even some tears. She promptly told us to tear off some of the leftover bread, and hold the piece in our mouth, between our lips. We all hesitated, thinking she was a bit of a loon, but the pain overcame us and we all sat there with pieces of bread hanging out of our closed mouths trying not to laugh at east other. And miraculously it worked! The onion sting went away. Maybe other non-inexperienced-cooks already knew of this, but I was just delighted. Of course, the bread was so good I ended up nibbling it away and sure enough the stinging eyes returned. I’m excited to make the koushari, but it will have to wait until we’re settled in Zamalek. We are still working with a limited kitchen in Maadi. In addition, the tomato sauce she made for it would make a great pasta sauce so I already have visions of making my own sauce and she told me where I can go to get fresh basil plants, so I’m heading there asap! Watch your local market shelves for “Miss Julia’s Raja-special tomato sauce,” it should be next to “Surviving Cairo and the First Year of Marriage” best-seller that you no doubt already have a copy of.